An essential recognition about the kinds of conceptual traps I’ve described in this chapter helps clarify why techniques like parts work can be as powerful as they are. The concern with such traps is more than just misplaced thinking. First, they reflect not just ideas, but how we hold reality. But as important, from the perspective of the person succumbing to the trap, not only does the thinking involved not feel misplaced, as experience it isn’t misplaced. It reflects “authentic” truth as perceived from the perspective of the part/inner character/crayon involved. This fact presents a major dilemma both for therapeutic work with individuals and with broader cultural change efforts. One of the cardinal rules of parts work is that I, as the therapist, do not talk to parts, only to the Whole-Person chair. If a person’s ideological identification means that he or she is engaging me from a crayon or part, there becomes, in effect, no way to make contact, much less connect in a way that could produce change. One reason that parts work has the dramatic results that it does is that it offers a way to get beyond this quandary. It is structured in a way that makes Integrative Meta-perspective its natural outcome. A good way to understand how the Parts Work approach produces this outcome is to think of it in terms of a specific kind of “cognitive rewiring.” Briefly examining this rewiring process highlights a couple of key contribution that Parts Work makes that are directly pertinent to our compare-and-contrast task. First is how Parts Work offers not just methodology, but a practical “definition” for culturally mature understanding (a significant accomplishment given the Dilemma of Representation). Second is how Parts Work provides a powerful tool for understanding how culturally mature perspective differs from other ways of thinking. The distinctions it implies get at what is necessarily different with culturally mature perspective in particularly direct ways. Three additional cardinal rules beyond my rule that I don’t talk to a person’s parts set the stage for these further recognitions. Each is a rule that the person doing parts work necessarily follows. When the goal is culturally mature perspective, these rules apply to understanding as a whole. With work that engages primarily at the level of personal maturity, they also apply, but in a more circumscribed way, with concerns limited to individual experience. Rule #1: Parts don’t talk to parts, only to the Whole-Person chair. Rule #2: Only the Whole-Person chair relates to the world. The parts don’t get to interact with the world. 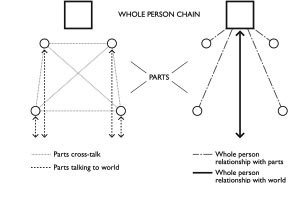 All communication with the world (including with me) happens through the Whole-Person chair. Rule #3: The Whole-Person chair is (creatively) in charge. It is from here that final decisions about what matters and what is to be done are made. In conversing with a part, the person listens to what the part says and makes use of the information—or not—depending on whether the message is helpful or not helpful. The person then makes needed determinations and is ultimately responsible for them. These rules define a new set of systemic relationships—both internal systemic relationships and just how the person relates to the world. Prior to Cultural Maturity’s threshold, parts often talk with each other and the Whole-Person chair is capable only of sporadic leadership. One consequence is now familiar: Experience organizes as polarity—whether that of polar ideology, or, at the level of overarching narrative, that of heroic/romantic explanation. Prior to Cultural Maturity’s threshold, parts also relate to the world with, again, the Whole-Person chair providing at best infrequent leadership. The result is a view of the world defined by two-halves-make-a-whole relationships and by projective idealizations and demonizations. With Cultural Maturity, the Whole-Person chair assumes both final responsibility and ultimate leadership. At the same time, it establishes a new depth and creative richness of connection with each of the parts. The new kind of cognitive “wiring” that results takes place in a related but more limited way with maturity in individual development. With Cultural Maturity, it manifests in a way that redefines our relationship to experience as a whole. It is important to appreciate just how fundamentally different this result is from what came before. (See the diagram in Figure 9-3.) The rules I just described help clarify what is different. Rule #1 cuts the “wires” through which the internal dramas of times past took place. Rule #2 cuts the “wires” that produce related external dramas and, by making the only “wire” that connects with the world that which takes expression from the Whole-Person chair, establishes mature responsibility and authority. Rule #3 makes it so that parts now link in a direct and explicitly creative manner to the Whole-Person chair and produces the possibility of newly complex and rich understanding. Taken together, these rules and the rewiring that results produce a new kind of leadership. This outcome doesn’t require a technique like Parts Work. Such “rewiring” underlies culturally mature capacities however we might acquire them. And it is there with new leadership wherever we find it—whether it is that which gives us culturally mature personal identity, that which produces Whole-Person relationships, or that needed for effective culturally mature leadership in the world. Notice that the kind of leadership that results from this rewiring process is very specifically the new, more “creative” sort that this book has been about. It is neither leadership in the old, more right-hand, command-and-control sense, nor leadership only in the sense of allowing, getting out of the way, or facilitating process. Rather, it is the more demanding, both more dynamic and systemically aware, kind of leadership on which our future depends. The fact that this rewiring process provides a concrete definition for culturally mature understanding has particular significance for our compare-and-contrast task. I’ve described how ideological views take aspects of systemic complexity and make those aspects the whole of truth. Culturally mature understanding becomes what we get when we sit solidly in that Whole-Person, Integrative Meta-perspective chair. This posture doesn’t give us final answers. But it does result in us better asking the right questions—questions that have the potential to lead to useful answers. This rewiring picture also helps make previous more specific compare-and-contrast distinctions more concrete. Dynamics that underlie the most explicit of Separation Fallacies and Unity Fallacies are easiest to recognize. With the most basic of Separation Fallacies a right-hand—more rational, scientific, or economically materialist—part directs the show. We see the most basic of Unity Fallacies when a left-hand—more spiritual or emotional—part prevails and interacts directly with the world. With philosophically idealist belief, left-hand parts again talk with right-hand parts, but the left-hand part has a special status—it is assumed to be the ultimately causal force. Depending on the particular kind of philosophically idealist belief, the “voice” that speaks to the world may talk from a variety of points on the left/right continuum. I’ve described how various philosophically idealist views may frame the future in more spiritual or more political terms (and political conclusions can themselves span the left/right spectrum). For our compare-and-contrast task, the important recognition is that each these various patterns produces a fundamentally different result than what we find with Integrative Meta-perspective. In no case does the Whole-Person chair hold the needed defining authority. And in no case are multiplicity’s aspects drawn on in ways that can give their diverse creative contributions full expression. Several important apparent contradictions touched on earlier become more understandable with this rewiring picture. The first brings us back to the question of whether culturally mature perspective is more complex or simpler than what it replaces. Cultural Maturity’s cognitive rewiring produces a result that is more complex in the sense that it requires greater Capacitance and also in the way that it more explicitly draws on a diverse array of creative elements. But in the sense that internal and external conflicting tendencies give way to a single, encompassing locus of determination, it is also simpler. A further apparent contradiction concerns the question of whether what we then see describes greater or less control. The answer to this question provides key support for a creative frame. Again we find that both result. That single point of determination in one sense very much means greater control—certainly it makes us more explicitly responsible and in charge. But “in charge” comes to have new meaning. Rather than greater control in the conventional sense, what we see is something ultimately much more significant: greater creative effectiveness and power. A key result suggested earlier is important both to understanding this more creative kind of control and to perceiving it as something we might want. Having the Whole-Person chair in charge does not diminish the power of parts as would be the outcome with control in the more traditional sense. The Whole-Person chair’s new solidity and authority allows each part to be most fully potent. Previously, the potential danger of doing damage to the person’s systemic completeness kept parts from fully manifesting their significance. With Integrative Meta-perspective, this danger disappears. Integrative Meta-perspective creates the ability to at once better manage the whole of our complexity and to draw most powerfully on that complexity. Using the box-of-crayons image, we become able not just to hold the whole box, but also to draw on the contributions of each of the crayons in ways that deeply tap each hue’s particular vibrancy. Addressing a potential confusion that could come with these reflections confronts us in another way with an essential systemic observation that I touched on with our initial look at culturally mature truth. We reasonably ask whether it is best to picture culturally mature truth as something that we find “at the center,” like the arrangement of chairs in Parts Work might suggest, or whether we more accurately think of truth as something that surrounds experience’s complexity, like with the crayon’s encompassing box. The question brings us back to a way I’ve described the conflicting positions of more humanistic and more behavioral interpretations. We also again encounter the Dilemma of Representation. In fact, as we would predict, each representation reflects an equally important part of what ultimately defines truth. The same holds for leadership and ultimately for identity. If we miss this larger systemic picture, we fall for predictable traps in our thinking.